Have you ever thought about how God’s Word has 40 different authors but each book is connected to the others? As Christians, we know this is the work of the Holy Spirit threading the Word of God together. We have been traveling through the Bible in our Common Thread series the last few weeks. This week we take a look at a familiar story, David and Goliath. But wait! It’s not what you think. We’ll learn about David’s courage and dig a little deeper into the story to see where David’s strength came from. Most of the time we see David’s courage and strength as child-like, and it is, but it is also deeper than that. The foundation of David’s courage is found in the promise God made to His people. As a young Israelite kid, we believe David knew of this promise that was made to his ancestor Abraham. And although he never referenced it, David knew he served the same God that called Abraham to believe and step out in faith. David did the same, he stepped out in faith and stood boldly before Goliath and defeated him. Do you have that same courage and confidence? David was able to see beyond the giant. He was able to confidently go before him because he was standing on the foundation of the great promise given to his ancestor Abraham! You too can have that same confidence. The promise that God gave to Abraham is enjoyed by us as believers through Abraham’s direct descendant, Jesus the Messiah. If you’ve missed the previous episodes of this series, you can find them in our Archives. Steve Conover: This is The Friends of Israel Today. I'm Steve Conover and with me is our host and teacher Chris Katulka. We're continuing our series called The Common Thread. Today, we're opening the Scriptures to 1 Samuel 17, a story in the Old Testament that probably all are familiar with, the story of David and Goliath. Chris Katulka: That's right. We are going into the story of David and Goliath. I know you might be thinking, "I've heard this before. I know what's coming. I've heard this message a dozen times," but this episode I want to show you how David, the Israelite, had confidence that was deeper than just boyhood faith. Steve Conover: This winter, archeological excavations in the Qumran area of Israel provided new insights on the community who wrote the Dead Sea Scrolls. The team was led by Hebrew University archeologist Oren Gutfeld and Liberty University's Randall Price. The two experts believe there are more artifacts and ancient documents to be discovered that may have slipped through Bedouin and looters hands. Chris Katulka: Steve, you know, the Dead Sea Scrolls are considered to be one of the most significant archeological finds in the 20th century. It's amazing because what the Dead Sea Scrolls did for biblical studies is it actually gave us an Old Testament that was written before Jesus. We've never had before the Dead Sea Scrolls were found in 1947, we never had an Old Testament that came prior to Christ. The only Old Testament that we had came from the 10th century A.D., that's a thousand years after Christ. This opened up a whole new realm of what the potential of this archeology could do for the study of the Old Testament. It's amazing because the entire Old Testament, except for Esther, is in the Dead Sea Scrolls. What it really shows is this is that God preserved his word. He preserved it for thousands of years so that we can know just how reliable and trustworthy it really is. Chris Katulka: We've been going through a series called The Common Thread. A common thread is an idea or a theme that is consistently present in several different areas or things. The bible is this divinely inspired book. It's God's word that spans nearly 2,000 years with 40 different authors and many of these authors didn't even know one another. They never communicated with each other. The prophet Amos never sat down over a cup of coffee with the apostle Paul to discuss certain themes that they'll share in God's word, or Moses never sat down with Luke who wrote the Gospel of Luke and Acts to make sure the trajectory of the first five books of Moses of the bible makes sense to the readers in Luke's gospel. No. God's word that spans 2,000 years with 40 different writers has a common thread that binds all the stories and characters and prophecies and writings all together. That common thread is found in the covenant God made with Abraham in Genesis 12 and Genesis 15. It's a promise that binds the whole bible together. It's the promise that God would give to the Jewish people a promise of a land, which is Israel, descendants, those are the Jewish people, and finally, a blessing. That God would bless those who bless Israel and curse those who take this covenant that God made with them lightly. That through Abraham, think about this, that through Abraham and his descendants they would bring blessing to all the families of the earth. Last week we studied why of all the places in the world God would choose the land of Israel to give Abraham and his descendants. That God providentially placed his people there right in Israel to make known to the world the one true God, the most high God, the God of Abraham, Isaac and Jacob. They were providentially placed in the land. Now, this week we're going to turn to a passage, like Steve said earlier, that I think many of you are going to be familiar with. It's the story of David and Goliath. I actually believe God's covenant with Abraham comes through it, comes across here when we see the confidence of young David as he stands up against the well-seasoned, well-armored and extremely large man, Goliath. But first, let's look back. Saul is the King of Israel in 1 Samuel 17. This chapter drops us right in the Valley of Elah in Israel, which sits almost in between Gibeah, which is the capital of Israel during the life of Saul, and Gath where Goliath comes from. He was a Philistine. Saul was battling the Philistines. It's going to be a constant battle during the life of Saul to get them off of the Israelite's back. This is just one of many battles that Saul has as the King of Israel with the Philistines, but it's designed ... The story in 1 Samuel 17 is designed and gives purpose to raise up the picture of who David's about to become, but let's get back to 1 Samuel 17. The Philistines and the Israelites were all lined up for battle in the Valley of Elah. That's when Goliath from Gath comes out. It says that Goliath was seven feet tall and he lugged around a very heavy suit of armor. The head of the spear alone for Goliath weighed 15 to 16 pounds. This is not the kind of guy you want to get in a fight with. Sure enough, 1 Samuel 17:11 says that Saul, Saul the king, Saul and the Israelites, they were upset and very afraid. Why? Because this incredibly intimidating guy was saying this, "I defy Israel's troops this day." He was saying, "I taunt, I mock, I scorn, I scathe, I insult, I slander, I shame, I disgrace Israel's army." That's what that Hebrew word, to defy. It can have all of those meanings. While Saul and Israel are shaking in their boots, young David comes be-bopping up from Bethlehem to the Valley of Elah to bring some food to his brothers who are actually serving in the army. When he arrived, he was chatting with his brothers and that's when Goliath appeared again to instigate another battle with Israel. Goliath actually had been doing this for 40 days straight now. Like clockwork, the men of Israel, it says, retreated from his presence. Then the text says that they were very afraid. This time, however, young David sees Goliath's rant and says, "What will be done for the man who strikes down this Philistine and frees Israel from this humiliation? For who is this uncircumcised Philistine that he defies the armies of the living God?" Young David uses the same word Goliath uses to shame the army of Israel. Also, it should be noted, this is the first time in the entire story as it's unfolding in 1 Samuel 17, this is the first time God's name is mentioned in the story of David and Goliath. Saul doesn't bring God into this battle. The Israelites don't bring God into this battle. It's young David who is just coming from Bethlehem to bring some food to his brothers who is the one who introduces God into this battle between the Israelites and the Philistines. It's David who views Goliath from a different point of view. Through the eyes of the Israelites, Goliath is undefeatable. But through the eyes of the living God, as David sees it, Goliath is nothing more than an uncircumcised Philistine. Meanwhile, when word got to Saul that David was willing to battle Goliath, King Saul said to David, "You aren't able to go against this Philistine and fight him. You're just a boy. He's been a warrior from his youth." David argues that even though he's young, he's battled lions and bears to defend his flock of sheep and Goliath is nothing more than one of those pesky lions or bears that's taunting God's flock. Notice again, David's point of view. He elevates Israel's army when he says that Goliath has defied the armies of the living God. This is amazing. From David's point of view, Israel shouldn't cower under the taunts of Goliath. They should have the confidence that God is their protector and shield. Israel is the army of the living God. They're not like every other army of the world at that time. They're not like the Hittite army, the Philistine army, the Canaanite army. They are totally different. David has a different point of view on God's army. The army of the living God. In David's eyes, this battle wasn't between Israel and Goliath. This battle is between God and Goliath. We all know the end of the story. David goes to Goliath with a sling and stones and says, "You're coming against me." I love this. Listen, "You are coming against me with a sword and a spear and a javelin, but I am coming against you in the name of the Lord of hosts." That's the Lord of the armies. "The name of the Lord of hosts. The God of Israel's armies whom you have defied. This very day the Lord will deliver you into my hand and I will strike you down and cut off your head. This day I will give the corpses of the Philistine army to the birds of the sky and the wild animals of the land. Then," listen to this, "Then all the land will realize that Israel has a God and all this assembly will know that this is not by sword or spear that the Lord saves, for the battle is the Lord's and he will deliver you into our hand." Sure enough, just as Goliath was going to mop up the floor with David, young David takes out a stone and slings it right between the eyes of Goliath, putting an end to Israel's taunter and elevating, glorifying Israel's God. Where in the world did David get this confidence? I mean King Saul and all the armies of Israel were frozen in fear when they saw Goliath, but David seemed to have this confidence that looked at Goliath differently than everyone else. Where in the world did this come from? Well, for me, I don't think David was ignorant of God's promises to Israel. All he had to do was look back through Israel's history leading up to this moment in the Valley of Elah, how God made a promise to Abraham that was preserved through Isaac and Jacob, and then the 12 sons of Jacob moved to Egypt and how God multiplied them and then God delivered from pharaoh 400 years later through 10 plagues, and then they walked through the sea on dry ground. God preserved them and protected them through the wilderness and saved them from being cursed by people like Balaam and Balak. God brought them into the land with Joshua and conquered the people around them. God blessed those who blessed them and cursed those who cursed them just as God promised in his covenant with Abraham. I believe that David's confidence in God's ability to defeat Goliath came from the promise God made to Abraham. I will bless those who bless you and curse those who even take this promise that God made to them lightly. Genesis 12:3. What did Goliath do the whole time? He cursed Israel. He took the promise God made to Abraham and his people lightly. As a result, God cursed him and the Philistines through David. David's faith and trust in God was grounded, it was rooted, it was tethered to God's faithfulness to the promise he made to Abraham long before David was even a thought in this father Jesse's mind. When we return, I want to look at how David's confidence to take on giants is the same confidence that can rub off on us who trust and believe in Jesus Christ. Be sure to stick around. Steve Conover: We'd like to share with you a book that has been helpful to us here at The Friends of Israel in our own studies, Charting the Bible Chronologically. This is hardbound full color piece by authors Ed Hindson and Thomas Ice gives you a panoramic view of the events recorded in scripture. With more than 40 charts of timelines and overviews of major empires, bible characters and events throughout history, we know you will enjoy it and reference it as much as we do as you study God's word both privately and in a group. 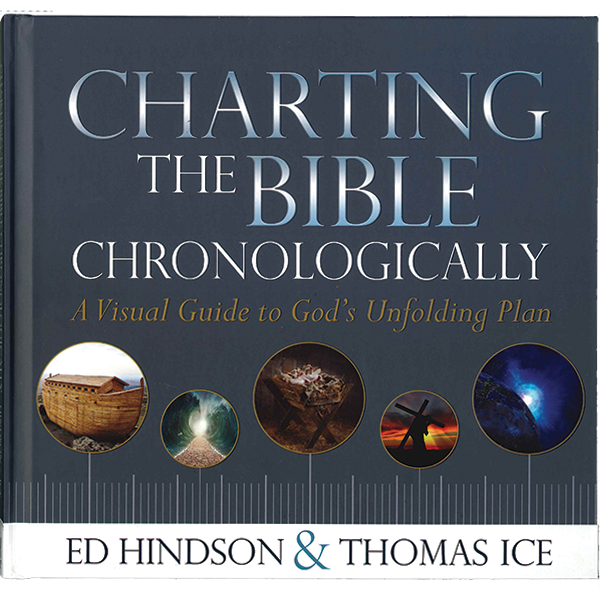 To order your copy of Charting the Bible Chronologically, go to foiradio.org or call our listener line at 888-343-6940. That's foiradio.org or call us at 888-343-6940. Chris Katulka: Welcome back, everyone. We've been talking about David and Goliath. We just recalled the story of David's defeat over the giant Philistine. A story that we're all familiar with, but I hope that it brought a different light to think of David relying and trusting and looking back to the faithfulness of God through the promise that he made to Abraham back in Genesis 12. Remember, David was only a young kid when he defeated Goliath. He did it when grown men were shaking in their boots. I think the question we need to ask ourselves is this, how did David have the confidence to challenge such a giant? Well, first, when the Israelites were in fear of Goliath, they were looking through human eyes at what seemed like an impossible giant to defeat. But when David arrived, like I said earlier, he looked at Goliath from a different point of view. For David, he looked at Goliath through the eyes of God and to God, Goliath was nothing but an ant that a little boy could step on. There are giants, friends, and you know this, there are giants that enter our lives. There are financial giants, financial mountains it almost feels like we climb. Family issues that feel like Goliaths that we have to deal with. Work issues that seem almost impossible to overcome. When we look at these moments, when we look at these obstacles, when we look at these giants through human eyes, our natural tendency is just like the Israelites, just like King Saul, to retreat. We end up like the Israelites, afraid, living in fear. But see, when you look at whatever problem you fear, from the point of view of our God, there is no giant that is big enough to defeat him. That's why David made it less an issue about how big Goliath was and made it more of an issue on how big our God is. Israel is the army of the living God. Notice how David did that. He said, "You're not just any old army, Israel. You are the army of the living God." Let me turn that back to us. We are children of the living God. Think about that. It changes everything when you have a different point of view. Also, let me ask you something important, do you have that same confidence that David did? The kind of confidence that allows you to see any given moment as God sees it. To have faith in the unknown because of God's faithfulness. The writer of Hebrews says this, "Now, faith is being sure of what we hope for, being convinced of what we do not see." Hebrews 11:1. See, faith is that place, think about this, faith is that place where we stand between God's faithfulness and what we cannot see. It's that place where we stand between God's faithfulness and the things that we just can't see, the unknowns. David's crazy confidence in God comes from his knowledge of God's faithfulness. God promised he would bless those who bless Israel and curse those who curse Israel. God has remained faithful to his people, think about this, even to today. David thought why wouldn't God remain faithful to his people now? The Abrahamic promise is embedded with protection and provision. Friends, if you are staring down giants right now, if you're facing certain unknowns, you can be sure of one thing, God has been faithful to you. His promises to you remain steadfast. They're sure. They're an anchor that ground us. In knowing God's faithfulness as believers in Jesus Christ who is connected to the Abrahamic promise, the promise that God made to Abraham, in knowing God's faithfulness from the very beginning to right now wherever you are, it can give us the confidence to step out and to conquer whatever giants are filling us with fear. Look at those giants not from your point of view. Look at them from God's point of view and remember how our faith is built on the bedrock, the faithfulness of God's promise in Christ Jesus. Steve Conover: Now, Apples of Gold, a dramatic reading from the life and ministry of Holocaust survivor Zvi Kalisher. Mike Kellogg: As I walked on the street recently, some Orthodox men were handing out fliers telling people if they serve the rabbis well, then they too will become holy and go to heaven. As I passed, they handed me one. They looked at me intently as I read their leaflet. Then one asked, "What do you have to say about what is written here?" It is a great pity. It is, as King Solomon wrote, vanity of vanities. All is vanity. Their faces showed their displeasure and they wanted to know why I said such a thing. Because I believe an Almighty God. You worship your rabbis. You accept what they say over what God says in his word. Now, they became suspicious. "Are you not from those who speak about this man?" One asked. I am not like you. I do not read fictional stories. You spend your lives studying rabbinic commentaries and I read the bible. We spoke for more than an hour. They were surprised I told them they were not following the right paths. "How can you say we are not following God? We're very active for him. Who is your God?" There is only one God. About him it is clearly written in the bible. I told them they have been taught wrong because they study rabbinic writings instead of God's word. "How can you say such a thing? Shame on you." Okay. Please show me what you read. They showed me a stack of books written by rabbis. I answered, "As it is written in Ecclesiastes 1:2, vanity. I believe according to the bible." Then I showed them Isaiah 53, where it is written, “..but he was wounded for our transgressions. He was bruised for our iniquities. The chastisement for our peace was upon him and by his stripes we are healed. Oh, we're like sheep who've gone astray. We've turned everyone to his own way and the Lord has laid on him the iniquity of us all. For the transgressions of my people he was stricken. When you make a soul an offering for sin, therefore, I will divide him a portion with a grate and he shall divide the spoil with the strong because he poured out his soul unto death and he was numbered with the transgressors. He bore the sin of many and made intercession for the transgressors." "We have never read this." This is part of the Holy Bible. All of its chapters were written by the Holy Spirit as was this chapter. They looked at each other with surprise. "We have learned much from you," they said. They need our prayers. Through prayer we can see God's mighty power and perhaps some day they will see it too. Steve Conover: Thanks for joining us today. I hope you're beginning to see this common thread, your faith that links you to God's promises to Abraham. Chris, can you remind our listeners how David's confidence in God's promises can help us as believers in Jesus today? Chris Katulka: Yeah. I think if you remember, there were kind of two ideas here. Number one was David's point of view. It was David who actually introduced God into the battle. For the whole story as it was unfolding, nobody was talking about God when it came to Goliath. All of a sudden David introduces God. Now, David looks at God. Young boy David looks at Goliath through the eyes of God. That's number one. Whatever battles God puts us in, wherever we are, whatever Goliaths we're facing, look at the issue through the eyes of God. It will change everything, that point of view. The other thing is this is that David was relying on the promises of God. Instead of just looking at the fear in front of him, he was grounded, his faith was grounded in the promise of what God said to Abraham many years ago. I believe this. I will bless those who bless you and curse those who curse you. I believe that gave David the confidence to say, "This is a battle God's fighting. I'm just merely his man." Steve Conover: Thank you, Chris. We hope you'll join us next week as we continue The Common Thread. Our host and teacher is Chris Katulka. Today's program was produced by Tom Gallione, co-written by Sarah Fern, Mike Kellogg wrote Apples of Gold. Our theme music was composed and performed by Jeremy Strong. I'm Steve Conover, executive producer. The Friends of Israel Today is a production of The Friends of Israel Gospel Ministry. We are a worldwide Christian ministry communicating biblical truth about Israel and the Messiah while fostering solidarity with the Jewish people. This hardbound, full color piece by authors Ed Hindson and Thomas Ice gives you a panoramic view of the events recorded in Scripture. With more than 40 charts of timelines and overviews of major empires, Bible characters, and events throughout history —we know you will enjoy it and reference it as much as we do as you study God’s Word both privately and with a group. Zvi walked by a group of orthodox men who were handing out flyers stating if people served rabbis well they would have the assurance of heaven. Zvi took the flyer and the men waited as he read the words. They then asked what Zvi thought of what he had just read. Listen as Zvi gently but boldly explains what the Word of God says about the assurance of heaven and how all men can have eternal life.